Are you eagerly seeking for M.Tech Jobs 2018? if your answer is yes then you are in the proper place. Aspirants who had completed M.Tech degree can apply for various IT Jobs by checking from this page. The candidates from different specializations in M.Tech such as Computer Science and Engineering, Information Technology, Mechanical Engineering, Software Engineering, Chemical Engineering, Electrical Engineering, Aerospace Engineering, Metallurgy, Applied Mechanics, Architecture and Planning, Mathematics etc can get the latest M.Tech Jobs from this article. There are a huge number of Jobs for M.Tech freshers. So from this article, the aspirants can find the M.Tech Jobs 2018 in multiple locations such as Noida, Gurgaon, Bangalore, Lucknow, Bhopal, Hyderabad, Chennai, Mumbai, Pune, Kolkata, Ahmedabad, Cochin. Candidates can also find the branch wise Freshers Jobs from this article. Scroll down the page and check the latest M.Tech Jobs 2018 for freshers without any confusion. The M.Tech graduates are seriously hunting for the Jobs in Information Technology. The Job Opportunities for the M.Tech are limited day by day. Only some of the MNC’s and Startups recruiting the M.Tech Graduates for IT Jobs. Mostly the M.Tech graduates are choosing the Teaching profession as the career option. There are a huge number of openings for the M.Tech Graduates in various colleges and universities who are having a good knowledge of a particular subject. Candidates should have good presentation and communication skills to become a teacher after M.Tech. Apart from the job, the aspirants can go for the higher education is to Doctoral Degree. After this, the aspirants can further get into the research area of work. Candidates can also check the M.Tech Off Campus Drives from our website. Masters of Technology is known as M.Tech. The M.Tech is a highly popular Post Graduation Program. This can be either an academic or professional masters degree in the field of engineering. Candidates can do M.Tech in various universities and colleges across India. This is 2 years of educational course and through this, the aspirants can do extensive education in particular field of engineering or technology. The aspirants who have done their M.Tech in the topmost colleges can easily get the job in any of the IT companies. And the candidates of Chemical Engineering, Electrical Engineering, Aerospace Engineering, Metallurgy, Applied Mechanics can get the job in core companies. But the candidates who complete M.Tech in normal colleges is difficult to find the job in MNC companies. The immense number of aspirants are exploring for the jobs but can’t find the suitable one. To help those candidates on our website we are providing the Jobs for M.Tech Computer Science Freshers, Jobs for M.Tech Mechanical Engineering Freshers, Jobs for M.Tech Electrical Engineering Freshers, Jobs for M.Tech Chemical Engineering Freshers, Jobs for M.Tech Aerospace Freshers, Jobs for M.Tech IT Freshers and other branches jobs. Candidates can check the M.Tech Jobs 2018 for freshers details from this page and apply for the vacancies. To get the job the aspirants have to come across the selection process conducting by the company officials. Clearing all the rounds in the selection should be the main aim for the candidate to secure the job. In order to help the aspirants, we are providing the Syllabus and Placement Papers on our website. Refer them and be the first one to get the job. A few of Multinational Companies (MNCs) IBM, Cognizant, Tech Mahindra, Mindtree, Google, Infosys, Yahoo, Capgemini, Wipro, HCL, Accenture, Oracle, iGate, Microsoft, Infosys, Tech Mahindra, and some of the startup companies are offering job openings for M.Tech Freshers. Contenders can also check the branch wise jobs from our website. This is the right place for the candidates to gather all the information about the latest M.Tech Jobs 2018. Candidates have to check the suitability details before applying for any of the positions. The aspirants have to check the information like eligibility criteria, skills required, selection process, responsibilities for the post etc. With all these details the candidates can come to an idea whether they are suitable for the position in the particular company. The Jobs for M.Tech CSE freshers are Software Developer, Senior Analytics Engineer, BRM consultant, Staff Engineer, Senior Java Developer, Principal Data Scientist, IP Design Manager, Graphic Designer etc. 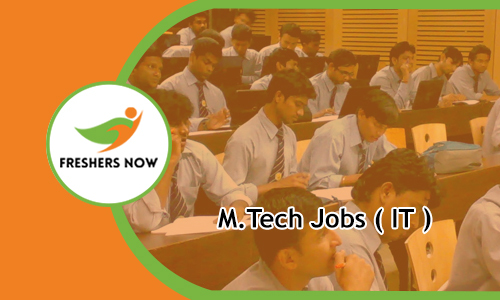 Jobs for M.Tech Electronics freshers are Electronics Engineer, Senior Technical Sales Support Engineer, Facilities Executive, Technical Officer, Technical Trainee Engineer, Technician etc. Many of the M.Tech fresher’s graduates are eagerly waiting for the M.Tech Jobs. To provide excellent IT Jobs for M.Tech Freshers we created this page. The aspirants can find the latest M.Tech Job Openings 2018 from this article. Day by day the competition for the jobs is increasing. So the candidates who are tense about the job can refer this article thoroughly. We are also providing the M.Tech Walkin Drives on this article for the convenient of the aspirants. We are providing the great platform for the aspirants who have completed their M.Tech recently and searching for the M.Tech Jobs 2018. Some of the companies are recruiting the candidates through walkin drives by conducting the various rounds. In the selection process, the difficult and toughest round is Interview Round. To help the aspirants for clearing the round we have provided some of the Interview Questions by collecting from various sources. Refer those questions and be ready to face the interview with full of confidence. For more M.Tech Jobs 2018 candidates can keep visiting our website Freshers Now on regular basis.